Cropped in length: 11.5ins to sideseam; finished length 20ins. Cabled ribbing at waist, cuff and neckband. Fastened with 6 very small buttons. Fair-isle chart over 86 rows. Designed with 4 contrast colours. Possible to sub Lambswool No 1 for the Angora. Or use scraps/stash yarns. Errata: The sleeve instructions omit a repeat of the fair-isle pattern. The pattern had been available from the Patricia Roberts store in London. The store is now closed. 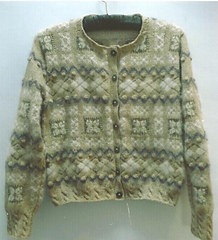 The pattern may become available through secondhand outlets.